Happy hump day, it's a great day because we're talking wrap dresses. The ultimate throw on and go outfit that is great for fall weather. I love a great print for this style of dress. 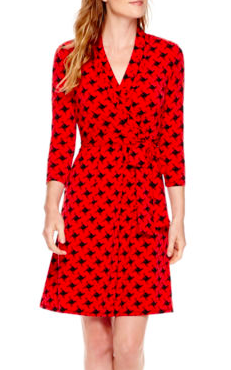 This season the 70s are back and bold prints and open necklines are perfect for a wrap dress. Check out this oversized collar, it is stunning. These billowy sleeves are super feminine. A great sized print makes this easy for any occasion. I can't tell you how often you're going to pull out this dress. It's absolutely stunning in this deep navy. Dress is up or down with shoes and jewelry. A pop of red is lovely for fall. You can add on a blazer if needed or just enjoy it on its own. 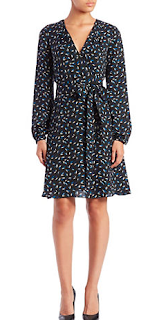 A great wrap dress works for any silhouette and most are machine washable. A great option to go from desk to drinks.